Garston Lodge of Installed Masters No 9403, or GLIM as its affectionally known, is, as its name would suggest, a lodge for those brethren who have achieved the master’s chair. 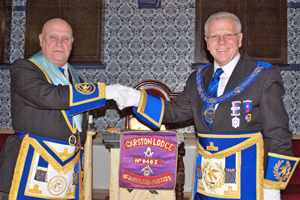 Rob Jones (left) with installing master Keith Lewis. Meeting at Garston Masonic Hall, it is a thriving lodge with increasing numbers. On the same evening it celebrated the installation of Rob Jones into the chair of King Solomon, it welcomed two new joining members. Rob is very well known within the Garston Group for, amongst his other undertakings, he is the group membership officer. With the current WM Keith Lewis in his rightful place and with the assistance of his officers, the routine business was swiftly conducted, which included successful ballots for the new members, Wally James and Jim Corcoran. Jim was then duly welcomed into the lodge, however, due to having recently undergone surgery, Wally’s welcome into the lodge will take place at a later date. Having completed the required administrative requirements, which included the reading of the dispensation for the required change of meeting date, due to the original date clashing with Provincial Grand Lodge, the formal duties of the evening were ready to commence. Before commencing the ceremony, Keith took the time to offer a very sincere and personal thanks to all the members of GLIM for their support, in what he said had been a very enjoyable year in office. For the ceremony, Keith was assisted by Arthur Newby, Derek Yoxall and Ken Bullen, who respectively occupied the positions of senior and junior warden and inner guard, all under the direction of the lodge director of ceremonies Derek Horrocks. 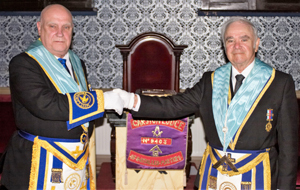 Derek, having previously left the lodge, returned to announce that Assistant Provincial Grand Master Derek Parkinson was without and demanded admission. Derek was accompanied by fellow grand officers Howard Griffiths, who is an active member of the lodge and Sam Robinson. Derek was warmly welcomed by Keith, who was only too pleased to offer him the gavel of the lodge, which Derek was equally pleased to give back. Rob Jones receives the congratulations of Derek Parkinson (right). As could be expected, the ceremony of installation was conducted in a manner conducive with such experienced brethren, nevertheless, their work merited the congratulations Derek was to offer later in the evening, most especially to installing master Keith. Rob proceeded to appoint the brethren into their new offices and the appropriate addresses were delivered, with the brethren of the lodge receiving their address from Derek. Included in these officers was newly appointed Provincial Grand Steward Phil Brown as SW. Now was the opportunity for Derek to offer Rob the congratulations of the Provincial Grand Master Tony Harrison, whom he said, had he been present, would have also congratulated Keith for all his work. He would also have congratulated Derek Horrocks for ensuring the smooth running of the evening’s ceremony. He continued by stating that Tony wished Rob a busy and successful year and that he and indeed all the brethren continue to enjoy their freemasonry. In his first official duty, Rob was pleased to present to Derek a cheque for the magnificent sum of £1,500 in support of the MCF 2021 Festival, which Derek was pleased to accept. Derek thanked the brethren for their support of this very worthy cause. At the festive board later in the evening, Derek spoke at length on the work done by the Masonic Charitable Foundation. For now, he was delighted to present to Rob, on behalf of the lodge, a certificate of Vice Patron of the festival. With the grand and Provincial grand officers having retired from the lodge, the remaining business of the evening was conducted, which included the proposition for yet another new member, helping to ensure the future of the lodge and that Rob and the brethren have work to look forward to in the ensuing year. An equally enjoyable festive board, included a poignant toast to the health to the new WM from Keith, as well as a detailed update from Derek on the work of the Masonic Charitable Foundation. He made particular mention of the assistance it is providing to bereavement support groups. He continued by informing the brethren that the Willowbrook Hospice in Prescot and St Mary’s Hospice in Ulverston had each received the sum of £19,400. 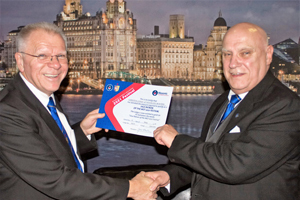 Also mentioned was the donation made by our own West Lancashire Masonic Foundation for the sum of £38,000 to purchase two ‘Blood Bikes’, which assist in the transportation of blood supplies and other medical necessities. Derek then offered his own congratulations to Rob, Keith and indeed all the brethren who had taken part in the evening’s ceremony. He wished Phil a very happy year in his capacity of Provincial Grand Steward urging him to take every opportunity to enjoy the experience. The traditional song to the new WM was performed by all, with a starring solo by lodge secretary and proud Welsh tenor David Jones. Arthur Newby was then treated to a rousing rendition of ‘Happy Birthday to you’ by all present, in celebration of his 90th birthday. During the evening a raffle was held as well as a ‘Dutch’ auction for a match ball signed by the entire squad of Champion’s League finalist Liverpool Football Club, pleasingly the charities benefitted from the proceeds. Derek was quite pleased too, as he managed to win both the match ball and a raffle prize! With the evening proceedings drawing to a close there was one last pleasant duty for Rob, which was to present to Derek a gift of an orchid plant for his wife Joan and a little liquid refreshment for Derek’s own enjoyment. With Derek thanking Rob and the brethren on both his own and Joan’s behalf, a most enjoyable and successful evening closed. Pictured from left to right, are: Sam Robinson, Howard Griffiths, Derek Parkinson, Rob Jones, Keith Lewis, Gary Mason (group secretary) and Phil Brown.